Well, that’s how you can Wedding Lehenga Reuse without even altering any part of your favorite attire. No scissors and stitching involved, just pair your gorgeous blouse and dupatta with a plain matching ghagra. Carrying your heavy wedding ghagra can be complicated, so just get your designer make you another ne to go with the dupatta and blouse! You can get a plain/floral saree of matching or contrasting colors, add up a matching border to it, and voila! Drape your saree matching it up with your wedding blouse. Well that’s totally cool and cost-effective, isn’t it? 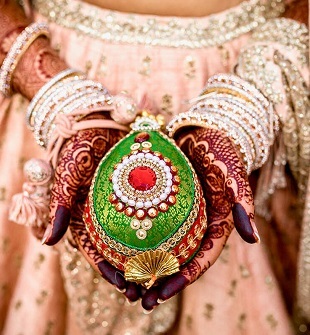 The dupatta of your lehenga is most definitely the favorite thing you will like to adorn again and again. 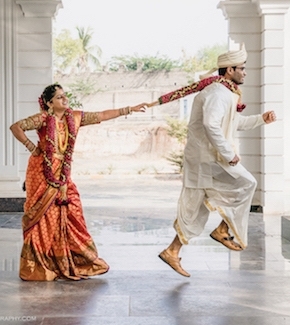 So here’s how you can do it without having to carry your heavy lehenga along. Get your designer to stitch a matching salwar suit of the same color or any color that might rock with it. Get a plain but shiny fabric so as to team well with your gorgeous dupatta. You can alter your wedding blouse to get something hotter than it originally was. Ask your designer to re-design it so that you can match it up with other ghagras or sarees. If your wedding blouse is golden, you have all the leverage to match it up with other colorful sarees with golden embellishments on it. Not only Wedding Lehenga Reuse but the blouse as well! Well, most of us just keep on nudging to our designer to add up a few more kilos to our lehenga so that it gets a voluminous look. The same volume pesters us later when we think of wearing it again. Wedding Lehenga Reuse, by getting rid of those extra kilos. 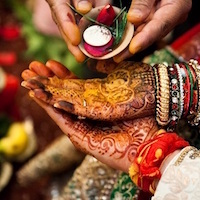 Recommended Read: Different Ways To Reuse Your Bridal Lehenga!! Another amazing thing you can do wedding Lehenga Reuse is to get it stitched into an Anarkali. Anarkali suits are totally in and you can ask your designer to stitch your lower and blouse in such a way that it gives the look of an Anarkali. You favorite lehenga will promise you another gorgeous day for sure. Innovation is all you need to look beautiful and different in the same outfit redesigned. You can also try draping your dupatta as a saree. Get a plain fabric that matches well with your dupatta. Drape it around and use your embellished dupatta for the hem of the saree. You are surely going to love this match.